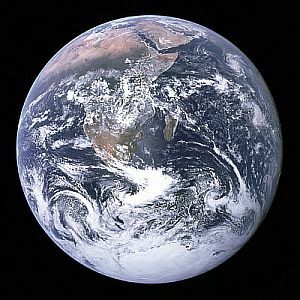 The planet Earth is the third planet from the Sun, the largest of the four terrestrial planets of the inner solar system. It is the only world known to harbour intelligent life, either in the solar system, or, indeed, anywhere in the observable Universe. That, of course, is the human race - us - although the "intelligent" part can be sometimes debatable. It is 7926 miles in diameter and weighs 5,972 million million million tons. Its orbit round the Sun is elliptical and, as a result, the planet Earth's distance from its star varies from 91,402,640 to 94,509,460 miles. This orbit takes 365.26 days, the extra 0.26 adding up over four years to necessitate the extra day in a leap year. 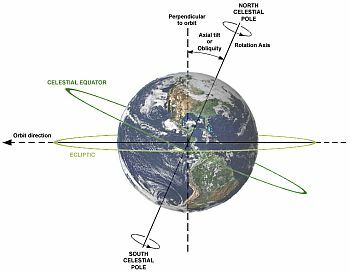 Earth rotates on its axis, on average, once every 24 hours. As we actually live on this globe and can study it close up, a lot more is known about it than any of the other bodies in our solar system. This is the layer at the surface of the planet and can be between three and 45 miles thick. The thin bits are found on the ocean bottoms and termed "oceanic crust", while the thicker parts - the bits we live on - are "continental crust". Both crust types contain silicon, but the continental one also contains aluminium, in contrast to the oceanic one, rich in magnesium. 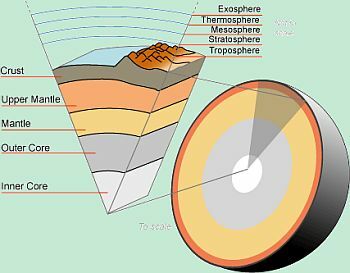 As well as the five different layers of the planet Earth's interior, it can also be divided into two sections - the lithosphere and the asthenosphere. The distinction between these is based on their mechanical motion. The lithosphere includes the crust and upper mantle and is generally solid, while the asthenosphere, consisting of part of the lower mantle, moves like a very thick liquid. These differing properties allow for the phenomenon known as plate tectonics. The only other body in the solar system that seems to have tectonic plates besides the planet Earth is Titan, Saturn's largest moon. At one time in the Earth's history, it is believed that all the continents were grouped together in one giant landmass, called Pangaea. 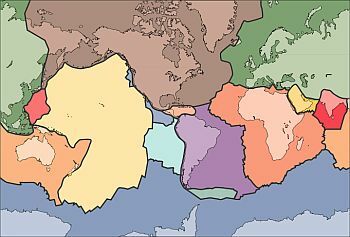 An early prediction of the science of plate tectonics was the notion of "continental drift", after it was noticed that the shape of the east coast of South America seemed to match that of the west coast of Africa, as if they once fitted together. Now it is known that the different tectonic plates are continuously on the move, at rates of between five and 15 millimetres a year. At their edges, things are unstable enough to create natural phenomena such as earthquakes and volcanoes. Beginning at the base of the crust and extending almost 1,800 miles into the Earth, this is, by far, the largest part of the planet Earth's interior. It is separated from the crust by a narrow layer called the "Mohorovičić Discontinuity" (thankfully abbreviated to "Moho"). This boundary was named after the Croatian seismologist who discovered it and marks a profound change in seismic activity. The mantle itself is subdivided into the upper and lower. The upper mantle is about 240 miles thick and has two distinct properties. As the lithosphere (mentioned above) includes the outer part of the upper mantle, this part is relatively rigid. Once the lithosphere finishes, the upper mantle becomes a lot more viscous, with a flow rate over three million times slower than pitch. At the end of the upper mantle, there is a transition layer some 155 miles thick. This is a very complex area, as it separates the upper and lower mantle. Thereafter, the lower mantle extends a further 1386 miles towards the centre of the planet. Very little is known about this area. There have been attempts to drill down to the mantle, usually from ocean beds, where the crust is thinnest. Unfortunately, at the time of writing, these have met with little success. Between the bottom of the mantle and the top of the core is a thin boundary, called variously the D'' layer, the core-mantle boundary (CMB), or the Gutenberg Discontinuity. Its presence was discovered due to seismic waves bouncing off it and it is thought to be necessary because it is where the solid mantle meets the liquid core. The core itself, like the mantle, is divided into two sections. The outer core is some 1,408 miles thick and is composed of nickel and iron. It temperature ranges from 4,400 degrees Celsius at its outer edge, to 6,100 at its inner boundary. Because the pressure here is not sufficient to cause it to solidify, the high temperatures maintain the nickel and iron in liquid form. The movement of this outer core is thought to generate a magnetic field for the planet Earth, directly affecting life on the planet. This magnetic field deflects the lethal solar wind. Without it, all life on Earth would be wiped out. The inner core is around 760 miles thick and consists of a solid iron-nickel alloy. This close to the centre of the planet, the temperature is about 5430 degrees Celsius. It is also thought to contain substantial amounts of gold and platinum. There are some interesting facts about the inner core. It is growing in size, very slowly. The interior of the core is gradually cooling, at a rate of 100 degrees Celsius every billion years. The inner core, being solid, is thought to revolve at a slightly different rate than the planet itself. The atmosphere of the planet Earth is divided into five main layers. It's difficult to estimate its thickness, because, the higher we go, the thinner it gets. It sort of just peters out. However, spacecraft re-entering the atmosphere start experiencing the first effects of this at an altitude of around 75 miles. The Earth's atmosphere is held in place by the pull of the planet's gravity. The lowest layer, beginning from the surface and extending from between 30,000 and 56,000 feet up. The higher we go, the colder it gets, with temperatures dropping to -60 degrees Celsius at its outer boundary. Because it is the densest layer, it comprises as much as 80% of the total mass of the atmosphere. 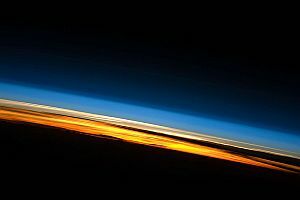 Extending some 32 miles into space, this area of atmosphere actually becomes warmer the higher it goes, due to heat absorption by the ozone layer. Thus, at its outer boundary, it could be as warm as 0 degrees Celsius. This layer carries on after the stratosphere, reaching over 50 miles into space. Throughout the layer, temperature decreases markedly, having reached, at its outer edge, around -100 degrees Celsius. This next layer can vary in thickness, according to activity in the Sun. It can be between 220 and 500 miles thick - by far the thickest of all the atmospheric layers so far. The air here is so thin that individual molecules only rarely collide with each other. Even so, these molecules absorb energetic solar radiation, causing a dramatic increase in temperature. During major activity on the Sun, the temperature within the thermosphere can reach as high as 2,500 degrees Celsius. Because of the extreme sparseness of matter, however, the effect of this high temperature is not really apparent. The International Space Station orbits the Earth within this layer. This layer represents the transition from atmosphere to outer space. Its outer boundary is defined as the point where individual molecules are no longer kept in orbit around Earth by its gravity, but are captured by the solar radiation pressure. Theoretically, this point is calculated at around 120,000 miles from the Earth's surface (about half the distance to the Moon). There are two other noteworthy layers within the Earth's atmosphere, one quite famous. This layer exists almost entirely within the stratosphere and its thickness can vary between nine and 22 miles. An ozone molecule contains three oxygen atoms, as opposed to ordinary oxygen, which contains two. The average concentration of ozone in the atmosphere is less than one part per million. However, this very small concentration is enough to deflect harmful UV rays from the Sun away from the planet's surface. Too much exposure to humans of these UV rays can cause skin cancer and blindness, so any damage to the ozone layer can have serious consequences. This layer encompasses parts of the mesosphere, thermosphere and exosphere and is, in essence, a plasma of charged particles. These ionized particles are created through interaction with ultraviolet radiation from the Sun. The layer begins around 30 miles above the surface of the Earth and goes on for well over 600. Its prime usefulness (for humans on Earth at least) is that it reflects radio waves, thus aiding radio communication, radar and even mobile phone use. This is a very important feature of the planet Earth, because it deflects the lethal solar wind - thus enabling life on the planet to exist. It is created by Earth's magnetic field, which is generated by movement of the liquid outer core, in a sort of dynamo effect. The magnetic north and south poles are reasonably near the geographical ones and may drift in position slightly over time. Also, the magnetic field periodically reverses polarity - maybe a few times every million years (the last such event happening 700,000 years ago). 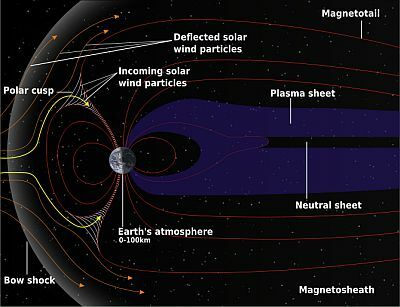 In this graphic, the solar wind is flowing left to right. It meets the magnetosphere at a point known as the "bow shock", which is about 51,500 miles out from Earth. When these two things collide, their interaction forms the Van Allen radiation belt, an area of highly charged particles. Any communication satellites staying within the Van Allen belt for an extended length of time risk serious damage. The planet Earth is the first one, moving outward from the Sun, that has a natural satellite - the Moon. It is unique in that it is the largest moon in relation to the planet it orbits. There have been many theories to account for the formation of the Moon, but these are dealt with on the Moon's own page. It does have some effect on Earth, however, the most famous probably being the creation of oceanic tides. Perhaps a more important effect stems from these and concerns the Earth's axial tilt. This is at an angle of 23.4 degrees and, as the Earth orbits the Sun, causes the four seasons. The Moon's creation of the tides has the side effect of stabilizing this axial tilt and keeping it more or less steady. Without the Moon, the tilt would fluctuate wildly and climate would become more extreme. Such a situation, it is believed, would have seriously jeopardised the possibility of advanced life to have evolved on the planet Earth.